Are pull-ups standing between you and Rx? Are you sick of flailing around on the bar? Boy, do we have the program for you! 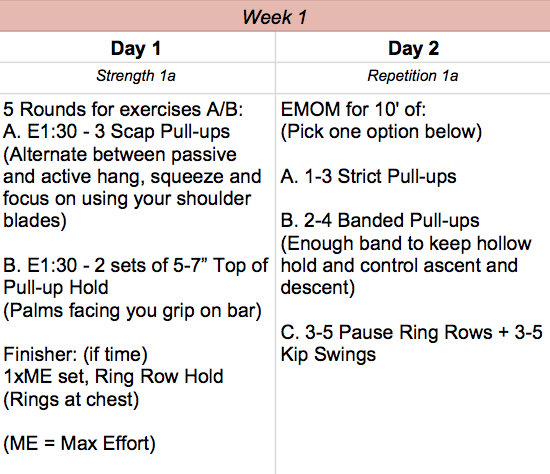 “6 Weeks to Kipping” is designed to help you increase your proficiency and strength on the pull-up bar, as well as help you achieve your first and/or multiple kipping pull-ups. We’ll focus on developing your understanding of the kip swing and build repetition to get you more comfortable on the bar. Before you dive in: We highly suggest building the strength to do 3 to 5 strict pull-ups before kipping. This will ensure your shoulders have the strength necessary to support kipping pull-ups; kipping too soon can lead to overuse and other shoulder injuries. This doesn’t mean you can’t work on your kip — you can build your strength and skill base, then graduate to kipping pull-ups when your muscles are strong enough to safely support the movement. The program is meant to be added to our regular CrossFit programming. You’ll need about 10 minutes two or three days a week before or after class. Focus on quality movement — don’t rush through just to get it done. If you’re unsure how to perform a movement, check out our Instagram each Monday for the week’s movements. 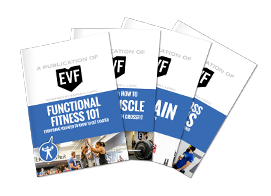 If you’re struggling with one of the exercises or with kipping in general, reach out to a coach before, during or after classes. Gymnastics class and personal training sessions can offer even more hands-on coaching. And remember, results come with patience. As with many things we do in CrossFit, this skill is developed through hours and hours of repetition and development. Feel free to repeat this program as many times as needed to achieve a kipping pull-up or string multiple reps. Good luck, and happy kipping!